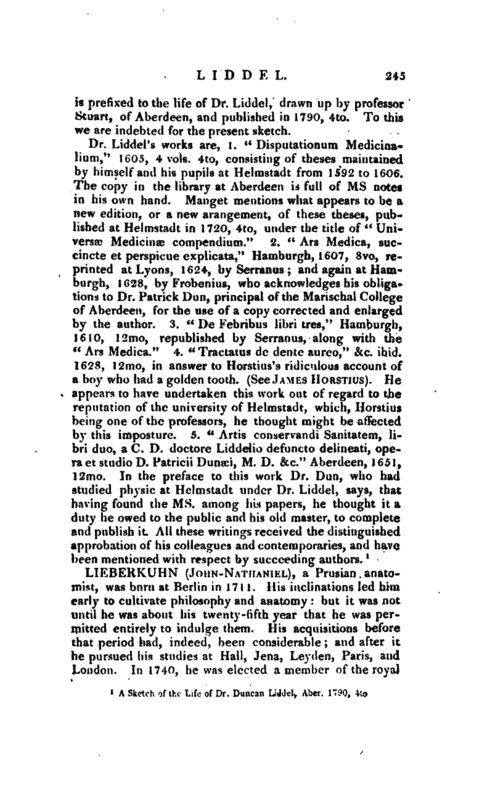 , professor of mathematics, and of medicine, in the university of Helmstadt, the son of John Liddel, a reputable citizen of Aberdeen, was born there in 1561, and educated in the languages and philosophy at the schools and university of Aberdeen. In 1579, having a great desire to visit foreign countries, he went from Scotland to Dantzic, and thence through Poland to Francfort on the Oder, where John Craig, afterwards first physician to James VI. king of Scotland, then taught logic and mathematics. 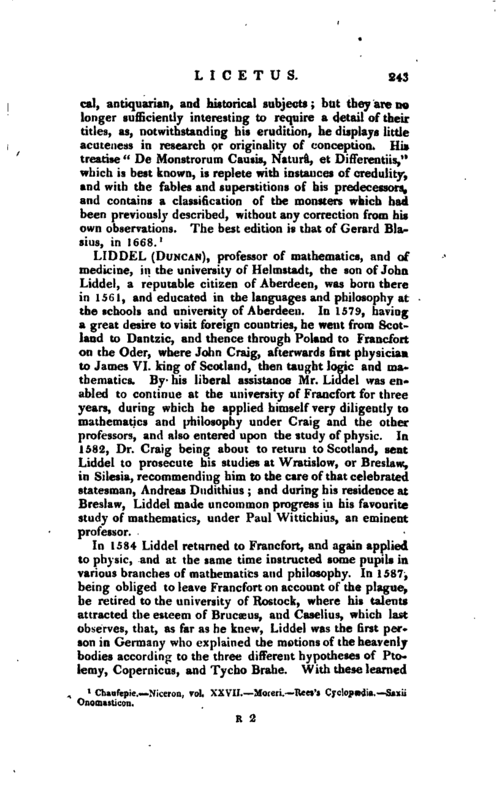 By his liberal assistance Mr. Liddei was enabled to continue at the university of Francfort for three years, during which he applied himself very diligently to mathematics and philosophy under Craig and the other professors, and also entered upon the study of physic. In 1582, Dr. Craig being about to return to Scotland, sent Liddel to prosecute his studies at Wratislow, or Breslaw, in Silesia, recommending him to the care of that celebrated statesman, Andreas Dudithius; and during his residence at Breslaw, Liddel made uncommon progress in his favourite study of mathematics, under Paul Wittichius, an eminent professor. In 1584 Liddel returned to Francfort, and again applied to physic, and at the same time instructed some pupils in various branches of mathematics and philosophy. In 1587, being obliged to leave Francfort on account of the plague, he retired to the university of Rostock, where his talents attracted the esteem of Brucseus, and Caselius, which last observes, that, as far as he knew, Liddel was the first person in Germany who explained the motions of the heavenly bodies according to the three different hypotheses of Ptolemy, Copernicus, and Tycho Brahe. With these learned | men he lived more like a companion than a pupil; and Brucxus, himself an excellent mathematician, acknowledged that he was instructed by Liddel in the more perfect knowledge of the Copernican system, and other astronomical questions. It was probably during his residence here that Licldel became acquainted with Tycho Brahe. In 1590, having taken his master’s degree at Rostock, he returned once more to Francfort; but, hearing of the increasing reputation of the new university at Helmstadt, where his friend Caselius had accepted the chair of philosophy, he removed thither, and in 1591 was appointed to the first or lower professorship of mathematics, and in 1594 to the second and more dignified mathematical chair, which he filled with great reputation to himself and to the university. In 1596 he obtained the degree of doctor of medicine, and both taught and practised physic, and was employed as first physician at the court of Brunswick. His reputation being now at its height, he was several times chosen dean of the faculties, both of philosophy and physic, and in 1604, pro-rector of the university, the year before he resigned his mathematical professorship. In 1607, having a strong inclination to pass the remainder of his days in his native country, which he had frequently visited during his residence at Helmstadt, he took a final leave of that city, and after travelling for some time through Germany and Italy, at length settled in Scotland. The first account we have of him after his return relates to his giving some lands, purchased by him near Aberdeen, to the university there for the education and support of six poor scholars. 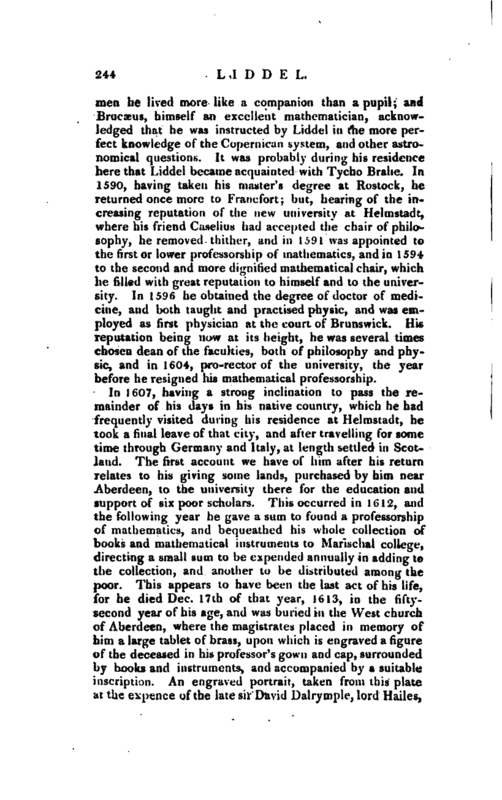 This occurred in 1612, and the following year he gave a sum to found a professorship of mathematics, and bequeathed his whole collection of books and mathematical instruments to Marischal college, directing a small sum to be expended annually in adding to the collection, and another to be distributed among the poor. This appears to have been the last act of his life, for he died Dec. 17th of that year, 1613, in the fiftysecond year of his age, and was buried in the West church of Aberdeen, where the magistrates placed in memory of him a large tablet of brass, upon which is engraved a figure of the deceased in his professor’s gown and cap, surrounded by books and instruments, and accompanied by a suitable inscription. An engraved portrait, taken from this plate at the expeiice of the late sir David Dairy mple, lord Hailes, | is prefixed to the life of Dr. Liddel, drawn up by professor Stuart, of Aberdeen, and published in 1790, 4to. To this we are indebted for the present sketch.